As approved by Office of the NRA Secretary (there are very strict guidelines, in addition to the 150-word limit). Current Director. Selected by Nominating Committee. Benefactor member. Proven defender of freedom as combat leader and uncompromising activist. USMA-West Point graduate. Ranger, Airborne, Armor officer. Veteran of Cold War, Europe Anti-Terrorism, Desert Storm. 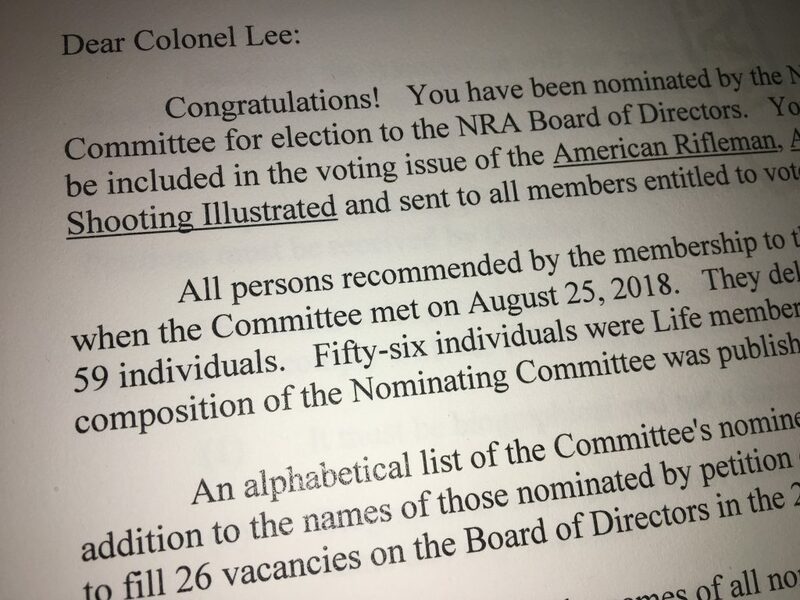 Chairman, NRA Outreach; Vice Chairman, Collegiate Programs; member, Military & Veterans’ Affairs, Legislative Policy, Grassroots Development Committees; Federal Affairs Subcommittee. Staunch Second Amendment advocate. Promotes women’s programs, Eddie Eagle®, NRA School Shield, NRA Foundation Friends Dinners. Former University of Kentucky Rifle Team sponsor. President, National Federation of Republican Assemblies, American Conservative Union Foundation Board member; former GOP State Chairman (Hawaii)/RNC member. Co-Chairman Trump-Pence Second Amendment Coalition. Life GOA, CCRKBA/SAF. Endorsed by Hawaii Rifle Association. SAF Defender of Liberty Award. Member VSSA, VCDL. NRA keynote Minnesota Gun Caucus rally. Led fight against Honolulu PD destruction of $500,000 of firearms. Army expert M1911, M16, M9, M3. Member Order of Saint George, Army’s mounted-force top award. Life VFW, MOAA. August 27, from NRA Secretary. Celebrities, inside the gun world and out, don’t campaign much. They don’t have too. Name recognition often earns them a top spot in the results. The rest of us campaign. NRA doesn’t tell who or where are the life & 5-year members. Grassroots candidates hope to send our message far and wide, hope to hit an NRA voter, hope to earn that voter’s support, then hope that voter mails their ballot. Overall, historically, on;y about 7%, you read that right, return ballots. (Though, clearly 100% + several million more of us have an opinion about the NRA or who sits on the Board). The only way I can get my message out is if you Share, repost or Forward my information, bio, endorsements to your contacts, and ask them to do the same to theirs. Some voting members are obvious, others are found in the most unlikely places and states. If you support me, push the word to others in your world, hope they are a voter, hope they will submit their ballot. Bullet vote. I want to earn your vote. Explained here www.ammoland.com/2018/01/nra-election-aim-your-vote. Regardless, mathematics tell us that if you vote for 25 folks to fill 25 slots, we’re all the same. Do your research. Name recognition of celebs is fine if you know the person, their work, and their commitment. To get the right people, those being the candidates you REALLY want on the Board, you must bullet vote. Vote for one (hopefully, me), perhaps three you know and trust, and absolutely no more than five. That separates them from the rest of the field, and helps ensure your vote(s) have weight. Then, you must Share your choice(s) for Board. It is MOST helpful if you produce a meme or short video and post it to all your social media – from Facebook, email, Instagram, Pintrest, Twitter and any other. Tag me, I’ll share your support. However, nothing has the impact with your friends as a does a message from you. YOU MUST SHARE. It shouldn’t be the case, but NRA is all you have between you and a handgun ban, or an AR ban. The political world has gotten tougher as our opponents have gotten more savvy. The NRA Board election is as important for you, the 2A supporter, as any important public office election. This is your NRA. It is all you have to safeguard your 2A. Take this responsibility seriously. Vote in the NRA election. I humbly ask for your vote.